Load cell click is a weight measurement click which utilizes a load cell element, in order to precisely measure the weight of an object. The Load Cell click can be used with the strain gauge type of load cells and can measure up to ±20V or ±40V of differential voltage. The strain gauge load cell is typically a circuit made of four strain gauges, connected in the Wheatstone bridge configuration. Very small voltage changes need to be accurately detected and converted into a digital form. 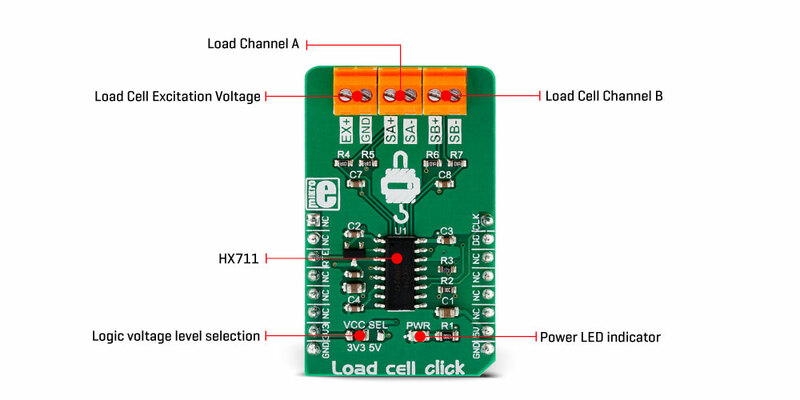 Load Cell click uses the HX711, a specialized 24bit analog to digital converter (ADC), designed for weight scale applications, made by Avia Semiconductor. This ADC is based on patented Avia technology, and represents an analog front-end device which offers all the required elements for building an accurate load cell application: the internal regulator allows powering up both the ADC section and excitation of the load cell, two 24bit differential channels with the low noise programmable gain amplifier with 32, 64, and 128 gain factor, which allow measurement range selection, mains power 50Hz and 60Hz interference rejection, selectable data output frequency up to 80 samples per second (SPS), and a simple serial communication interface. Load Cell click can be used in a wide range of weight measurement applications, but it can be also utilized to measure the strain force applied on shafts, machine parts, and other similar objects, exposed to forces that cause strain. The Load Cell click is based on the HX711, a specialized 24bit analog to digital converter (ADC), designed for weight scale applications, made by Avia Semiconductor. Among other sections, this device incorporates two high resolution (24bit) A/D converters (ADC) with differential inputs and internal low-noise programmable gain amplifiers. Since the input voltages are very low, this is required in order to obtain the best possible signal to noise ratio from the load cell connected at the input terminals. The load cell typically has four strain gauges which are actually planar resistors, are able to change their resistance when compressed or stretched, due to changes in their geometry. The load cell itself is typically a piece of metal with enough elasticity, resistant to the material fatigue, so it can withstand a large number of measurements, before it has to be recalibrated. When a strain force is applied to the load cell, one pair of the strain gauges that form a Wheatstone bridge will become stretched, while the other pair of strain gauges will become compressed. The small voltage difference will appear across the bridge, proportional to the applied stain force. This voltage difference is in the range of mV and can be measured and sampled in order to read the strain force intensity. Therefore, the load cell forms a transducer which directly translates applied force to a voltage. As already mentioned before, the main task of the HX711 IC is to sample the voltage across the bridge as accurately as possible and with the least amount of noise. The Wheatstone bridge formed by strain gauges is attached to an excitation power source, so that the resistance changes can be detected. The HX711 has a dedicated regulated voltage output, which is used to provide the necessary excitation voltage. Two differential inputs are used to connect the loads, offering various gain factors. The first differential input (labeled as A) offers a selectable gain of 64 X or 128 X. The second differential input (labeled as B) offers fixed 32X gain factor. This offers a possibility to select the desired gain factor, according to the used load cell and the magnitude of the strain force. 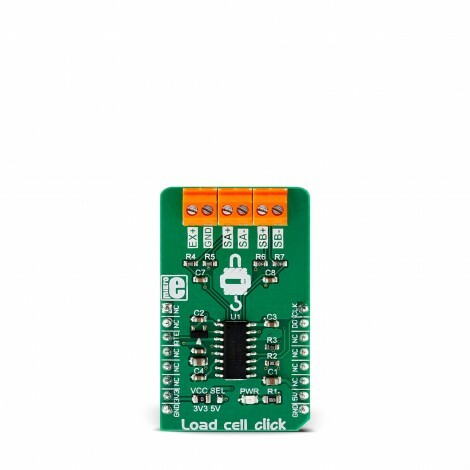 Load Cell click offers serial communication utilizing the on-chip clock oscillator. 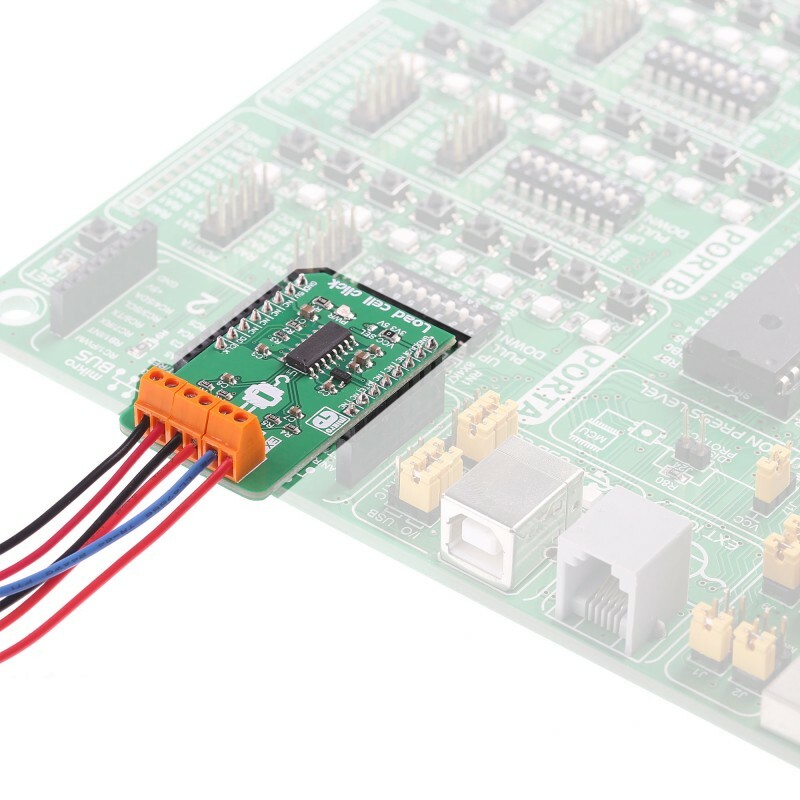 The data output rate is selectable and depends on the logical state of the RTE pin, routed to the mikroBUS™ CS pin. A HIGH logic level on this pin will set the output data rate at 80 samples per second (SPS), while the LOW logic level will set the data rate to 10 SPS. 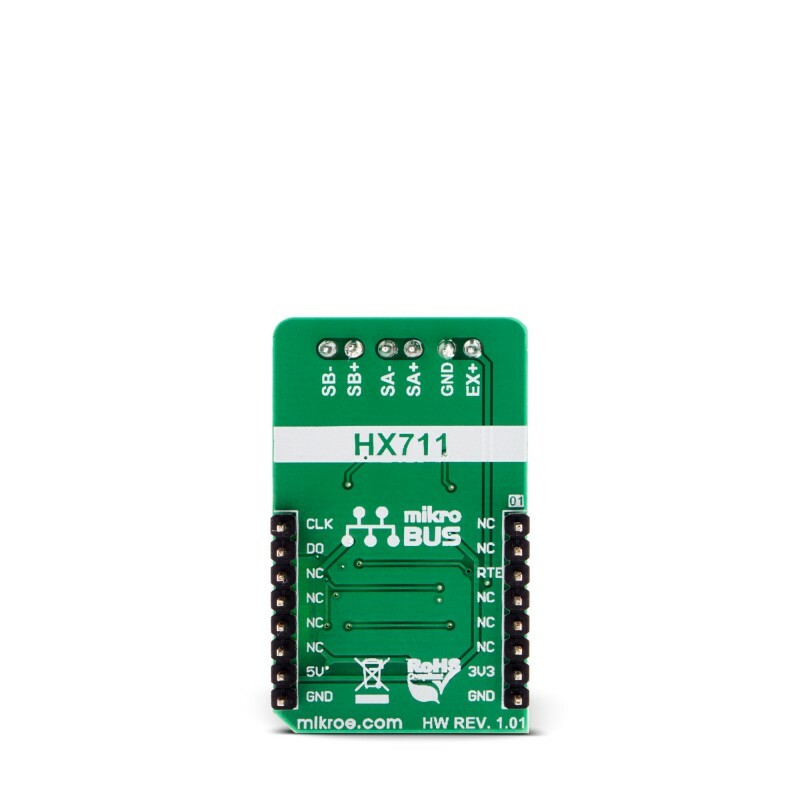 The serial communication of the HX711 IC is rather specific: when the data output pin (DO) goes to a LOW logic level, the host microcontroller (MCU) can start generating clock pulses on the SCK pin. With the next 24 pulses, the data is clocked out, while the 25th clock pulse will set the DO pin to a HIGH logic level again. The number of clock pulses after the DO pin goes LOW is used to determine the gain level and the ADC channel for the next conversion. For example, if 27 pulses are applied after DO pin goes to a LOW logic level, the next conversion will clock out the data from channel A with the gain amplifier (PGA) set to 64X. More information about the communication protocol can be found in the HX711 datasheet. 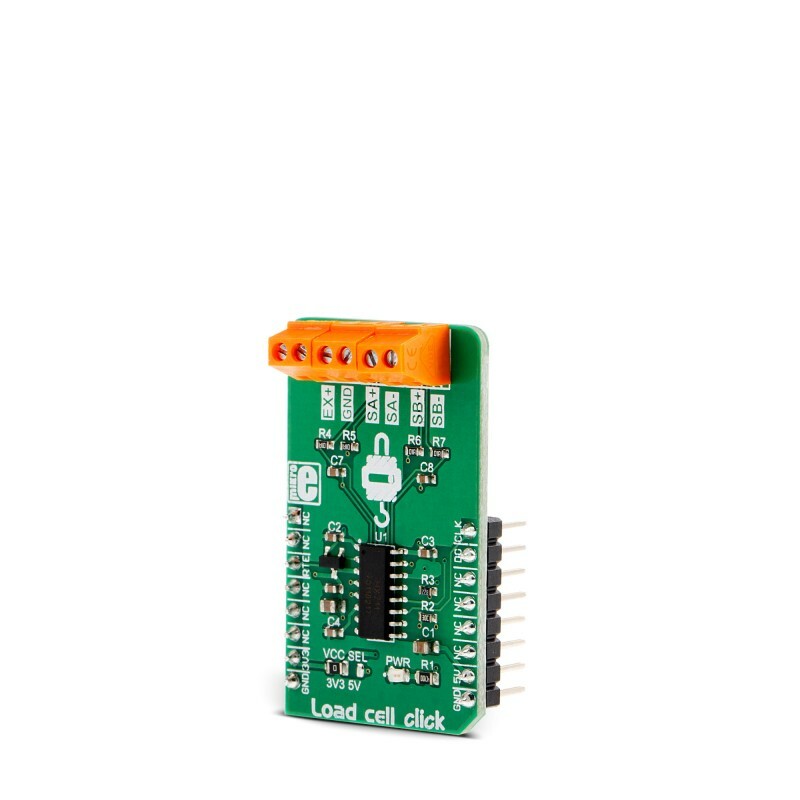 However, the chip communication is taken care of in the library supplied with the Click board™, which contains simple to use functions, compatible with all MikroElektronika compilers. The SCK pin is also used to power down the IC: if the SCK pin stays HIGH for more than 60µs, the HX711 IC will enter power down mode. As soon as the pin has been pulled to a LOW logic level, (provided that the valid power supply is still present) the IC will power up again and reset the registers to their default values (Input A, PGA set to 128X). The power supply voltage selection for the logic section for the HX711 is done by moving the SMD jumper labeled as VCC SEL to a desired position: left position to select 3.3V, right position to select 5V. The power supply for the internal LDO is fixed at 5V. 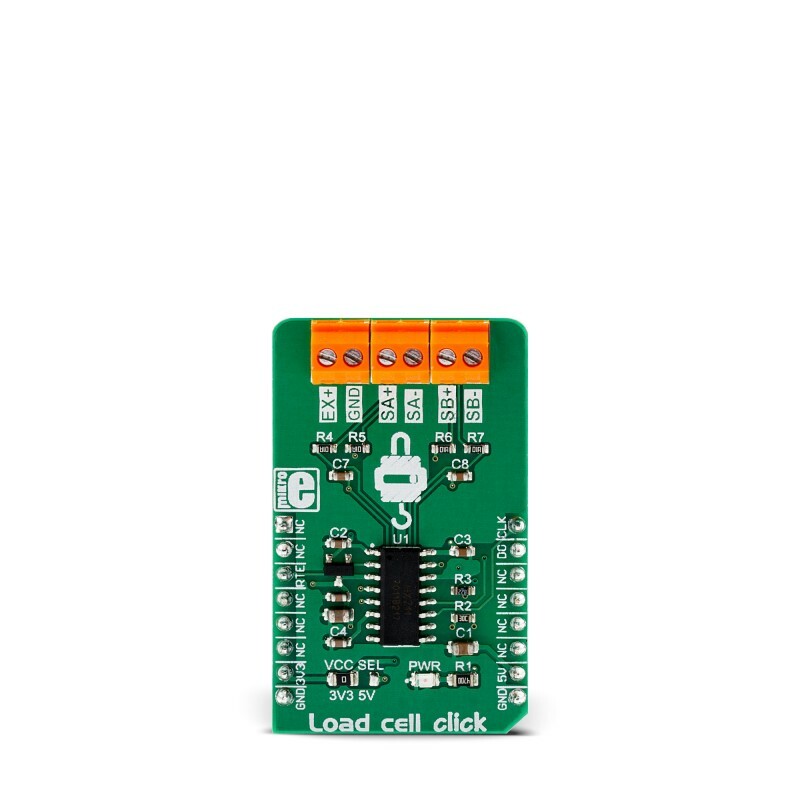 This will allow both 3.3V and 5V MCUs to be interfaced with the Click board™ directly. This table shows how the pinout on Load cell click corresponds to the pinout on the mikroBUS™ socket (the latter shown in the two middle columns). We provide a demo application for Load cell Click on our Libstock page, as well as a demo application (example), developed using MikroElektronika compilers. The demo can run on all the main MikroElektronika development boards. Library reads 24-bit digital converted results from the desired channel with determined rate value (which determines the frequency of internal oscillator). For more details check documentation. uint8_t loadcell_readResults( uint8_t inputSel, uint32_t *dataOut ) - Function reads the converted results from desired channel with determined gate value. void loadcell_setRate( uint8_t rateSel ) - Function selects the frequency of internal oscillator. void loadcell_setMode( uint8_t powerMode ) - Function puts the device in Power Up or Power Down Mode. - System Initialization - Initializes peripherals and pins. - Application Initialization - Initializes GPIO driver and performs the device reset, after which the next conversion cycle will be for channel A with 128 gate value. This function also selects the frequency of internal oscillator to 10Hz. - Application Task - (code snippet) - Logs the converted results for both channels with different gate value on UART every 500ms. Note: The converted results are 24-bit digital value (min - 0x800000, max - 0x7FFFFF), and in this example the results will be shown as decimal value.